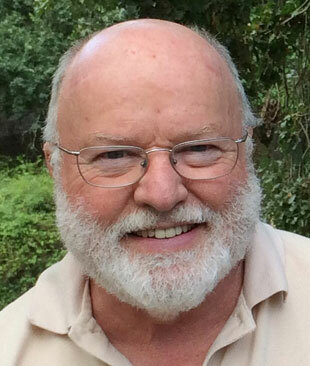 - Richard Rohr was born in 1943 in Kansas, mid-west USA ; he is 73 years of age. - He is a Franciscan priest, teacher, retreat leader, an internationally known speaker and presenter, and the author of many books (one listing I found has 23 books written by him). - In 1961, at the age of 18 years, Rohr entered the Franciscans religious Order. - Nine years later, In 1970, at the age of 27, he received his Master's Degree in Theology from the University of Dayton, a private Roman Catholic national research university in Ohio. - In the same year, 1970, he was ordained as a Roman Catholic priest. - The following year, in 1971, Rohr became the founder of the New Jerusalem Community, an intentional community in Cincinnati, Ohio. He served as its leader for 14 years, from its beginning until 1985. The Community continues to be a Catholic lay group of families seeking to live out the Christian gospel - in community with each other, with the working class neighbourhood in which they live, and with the wider world through mission projects. Currently there are about 110 adult members of the community and 45 children. - In 1986 Rohr went on to found the Center for Action and Contemplation (CAC) in Albuquerque, New Mexico. He currently serves as the Founding Director of the Centre, and as Academic Dean of the Living School for Action and Contemplation, which operates from the Centre. Fr. Richard was one of several spiritual leaders featured in the 2006 documentary film ONE: The Movie (ONE: The Movie is an independent documentary that surveys beliefs on the meaning of life, culminating with the view that "we are all one"). He has been included in Watkins’ Mind Body Spirit Magazine List of the 100 Most Spiritually Influential Living People, including their list for 2016. He has given presentations with many spiritual leaders such as Rob Bell, Cynthia Bourgeault, Joan Chittister, Shane Claiborne, James Finley, Laurence Freeman, Thomas Keating, Ronald Rolheiser, Jim Wallis, and the Dalai Lama. - A fascinating insight into Richard Rohr’s background, his intellectual development, and spiritual journey is provided by the author himself in Chapter 9 of his book Falling Upward . The CAC was founded 30 years ago, in 1986, by Richard Rohr, and supports his ecumenical ministry through its extensive programs and services. - The Center seeks to empower individuals to live out their sacred soul tasks in service to the world , through contemplative programs and resources. - Living School: Two-year program, combining onsite and online learning, derived from Fr. Richard Rohr’s wisdom lineage and teaching themes. o The Franciscan Way : Explore the courageous heart of the Franciscan Way, discovering how all is held within the Univocity of Being. o Immortal Diamond: Learn what the Crucifixion and Resurrection really mean for your transformative journey. - Webcasts: Live teachings from Fr. Richard streamed online, around the world. - CAC Bookstore: A comprehensive selection of Fr. Richard’s books and recordings. - Richard Rohr’s Daily Meditations: Free daily or weekly email reflections by Fr. Richard. Rohr makes frequent reference in his writings and teachings to the Wisdom Lineage that underlies his thought and work, and which includes the teachers, texts, and traditions that have most formed his own ideas and experiences of God. · Spiral Dynamics and Integral Theory - term from Ken Wilber (who calls it Integral Theory)– the latest attempt to chart growth, levels of maturity, morality, consciousness – proposes 9 levels of Consciousness (which in Christianity relate to the Purgative Way, the Illuminative and the Unitive Way ) – people and cultures can be operating at these different levels in relation to violence, fear etc . The concept of the Perennial Tradition is central to and permeates Rohr’s thought, teachings and writing. It is concerned with the perennial truths that all religions share, and is found as a recurring theme in all of the world’s religions and philosophies. The Perennial Tradition points to the Divine Reality underneath and inherent in all things, and the human soul’s capacity and longing for union with this Divine Reality. 1. Scripture as validated by experience, and experience as validated by Tradition are good scales for one’s spiritual worldview (METHODOLOGY). 2. If God is Trinity and Jesus is the face of God, then it is a benevolent universe. God is not someone to be afraid of, but is the Ground of Being and on our side (FOUNDATION). 3. For those who see deeply there is only One Reality. By reason of the Incarnation, there is no truthful distinction between sacred and profane (FRAME). 4. Everything belongs. No one needs to be punished, scapegoated, or excluded. We cannot directly fight or separate ourselves from evil or untruth. Darkness becomes apparent when exposed to the Light (ECUMENICAL). 5. The “separate self” is the major problem, not the shadow self which only takes deeper forms of disguise (TRANSFORMATION). 6. The path of descent is the path of transformation. Darkness, failure, relapse, death, and woundedness are our primary teachers, rather than ideas or doctrines (PROCESS). 7. Reality is paradoxical and complementary. Non-dual thinking is the highest level of consciousness. Divine union, not private perfection, is the goal of all religion (GOAL). · I find his writing easy to read and yet I find great depth in his work . · What I read in his work seems to make deep sense and rings true at a soul/spiritual level. · Not having a background in theology, his work helps me to learn more about the teachings and messages in the Bible / Scriptures – both the Old and New Testament, and also to deepen and expand my understanding of the teachings of Jesus Christ, of spirituality and of the Divine. · Rohr presents his topics/themes in many and different ways, and from different angles, and this helps to create familiarity and gradually a deepening understanding of what he is trying to convey. I find his combined focus on scripture, tradition, and inner experience or practice based spirituality (the 3 pronged methodology in the Living School) very helpful – “Scripture as validated by experience, and experience as validated by Tradition” Preface to Immortal Diamond. · As with many spiritual teachings and truths, we may have heard it before, but do we really get it and take it on board? Rohr’s work, through his writing, talks, and his teaching, has a central aim – to reach us and help us to “get it”! · Rohr uses metaphor to help convey his meaning - which engages the imagination, and helps to anchor his message at a deeper, soul-feeling level - the images and metaphors he uses stay with us (e.g. the metaphor of the container / contents for the 1st& 2nd half of life in Falling Upward, mining and searching for the diamond in Immortal Diamond). · I like how he uses epigraphs and frequently quotes from other writers/spiritual teachers throughout his work, to help elucidate his themes (his Wisdom Lineage). it’s a great way to be introduced to the works of these others, and it lends support, weight and credibility to his writing and ideas, by setting them within the broader and historical context of these authors, teachers and mystics. This helps me to trust what I am reading from Rohr, because a lot of what he says has been known long before. · I am attracted to his notion of the non-dualistic mind or unitive consciousness – the contemplative mind, the trans-rational, where paradoxes can be held. It expands my consciousness and opens my heart, mind and soul, and gives me a way to sit within mystery and the Unknowable. · I also find Rohr’s frequent critique of some aspects of organized religion refreshing – reading Rohr has inspired me to continue to pursue my interest in the deep messages and truths underlying all religions, and to search for what unites over what divides. · In the two books I have chosen to focus on in the Spiritual Reading Group, Falling Upward and Immortal Diamond, Rohr takes us on a journey into the nature of our true selves, and our relation to God or the Divine. He presents these themes in different ways in each book, but his essential message is that God /the Divine is Love and compassion, that the core of our true spiritual selves is comprised of that same Love, and that Love will always be stronger than death. · Our true life task is to awaken and discover our True Self, that has been given to us as our birthright – “our own bit of Heaven”; the Holy Spirit within – the homing device in our soul. · According to Rohr, the phrase “two halves of life” was first popularised by the psychologist Carl Jung. Rohr says that in the first half of our lives we are primarily concerned with establishing identity, our roles in life and society, security, relationships, sexuality, success, etc . He describes this process as forming our “container”, but according to Rohr, this is not who we truly are, and while a necessary part of life, it is not an end in itself. · He suggests that we only begin to discover who we truly are (in a deeper and spiritual sense), and begin to fill the “contents “of our “container”, when we cross over into the second halves of our lives, which is not a matter of chronological age. According to Rohr, those of us who make that crossing (and not all of us do) are often called by an inner longing –a homesickness, and are led there by mystery/Grace; as well as being compelled through “necessary suffering” in our lives, to move beyond our comfort zones and resistances, towards the realizations and transformations that unfold during the second half of life. · Rohr uses the Greek myth of the Odyssey by Homer to illustrate the archetypal and primal nature of this transition : on returning home from his many adventures, as prophesied by the blind seer Teiresias, Odysseus ,the King of Ithaca, must leave again and undertake a second journey before he can truly return home, back where he first started. The myth illustrates the movement and development from “human doing” to “human being”. · The inner work of dealing with our shadow sides (the disowned part of ourselves) and coming to terms and accepting our weakness, failures and vulnerabilities is presented as a crucial aspect of both personal and spiritual growth and development - it is through the “falling down” that we move “on and upward”. The idea that “we grow spiritually much more by doing it wrong than by doing it right” - this is a very counter-intuitive message. · It is only in the second half of life that our soul reveals its mysteries, and we need a lot of faith and trust, and guidance, to get there. The Holy Spirit, who abides in our Soul, guides us both from home and to home. · The metaphor of a diamond is used to further explore the true self, how it is formed under extreme pressure and over much time, how it needs to be mined to be discovered, and how out of seemingly worthless raw materials, the purity and transparency of the diamond is formed and remains in immortal everlasting form. We are drawn towards its brilliance. We don’t really find it – it gradually appears as we do the work of “growing up”. · This metaphor is used alongside the central theme of the incarnation, death and resurrection of Jesus Christ. The Christ mystery is presented throughout the work as the necessary pattern for the fulfilment of our own human journey: our false self must die and give way before our true self can emerge. Jesus as the Cosmic Christ is shown to be the model and archetype for “the full journey and final direction of Consciousness”. · This inner journey to transformation, authenticity and full consciousness is often resisted, avoided, and feared, and the existence of our true self – the Divine Presence within, is often denied. · According to Rohr, in identifying with and attaching ourselves to our false self, we become split from reality and our true nature in God. We live in illusion. We need to overcome being split and separate from the following: from our shadow self, from our body and soul, from death, and from others. · Grace is what carries us across, through the depths and through death, to the other side – not our own efforts, purity or perfection; but we do need “deep desire”. · Our true self is our most intimate self and is ultimately to be found in our vulnerability, and in our ability to open ourselves, in relationship, to Love and compassion, which is the self-same nature of the Divine. The essential message being portrayed is: “What we seek is what we are”. · Religion as participation, rather than preoccupation with religious ideas, is a rediscovery of the Perennial tradition, and recognizes that we are a part of something, more than we are observing something. · The Spiritual Question we need to ask is: Does our life give any evidence of an encounter with God? Does this encounter bring about in us any of “the fruits of the Spirit”, as described by St Paul – love, joy, peace, patience, kindness, goodness, trustfulness, gentleness, self-control? Are we (or the group we belong to) different from our surroundings after this encounter, or do we reflect the predictable cultural values and biases of our group? On Tuesday the 18th of October Susan Southall gave an introductory paper on the poet, artist, and calligrapher David Jones, as part of the Carmelite Library’s regular Spiritual Reading Group. Here is her paper, with some images relevant to the text. David Jones never described himself as a scholar. An artist, a craftsman, even a writer, but in spite of evident erudition he never called himself a scholar. I begin with this because of the average half page of footnotes on each page of his long poems, In Parenthesis and The Anathemata, as well as everything else he ever wrote. W.H. 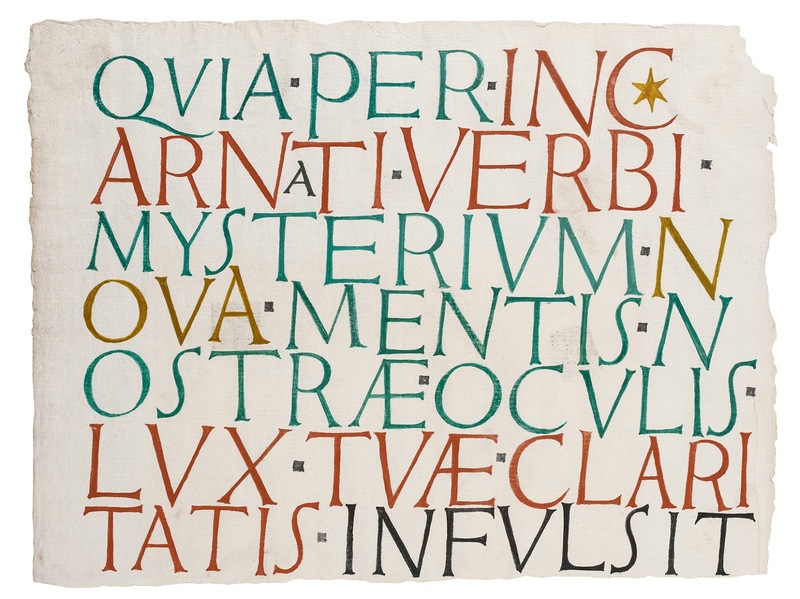 Auden called The Anathemata the greatest long poem in English of the 20th century. In Parenthesis is the greatest poem to come out of World War One. Yet Jones considered himself primarily an artist, and he is among the greats, although unique, of English painting. 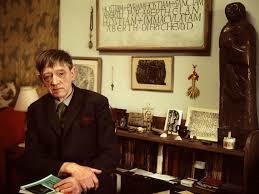 David Jones himself was an Englishman, although he felt closer to his Welsh roots. His father was a Welsh-speaking Welshman, while his mother was from London. He was born in 1895 which made him the perfect age for the army in the World War One. His early studies were at the Camberwell Art School, but the work available would have been illustration, which didn’t interest him, or teaching: he refused to take the qualifying exams to teach. Joining the army as a private solved his career problems. He was wounded in 1916 at Mametz Wood, where the 38th (Welsh) Division was sited during the Battle of the Somme. In Parenthesis deals with the events of this battle as a figure of the nature and fate of man. After the war, he resumed his studies and in 1921 he joined Eric Gill at his community of artists and craftsmen at Ditchling in Sussex. He became an extraordinary painter in watercolour, creating pictures of mystical depth, rich in history and mythology. For a while he was engaged to Gill’s daughter Petra, a weaver, but she felt he would never want a family: the engagement, which had been blessed in the Ditchling community chapel, was broken off, and Petra married another of the artists, had six children, and lived to the age of 92. The Ditchling community were Roman Catholics, and most of them were Dominican tertiaries. 1921 was the moment of truth in the life of David Jones, when he was received into the Roman Catholic Church. The whole of his life and work from that time hence is coloured by this event. In Parenthesis, begun in 1927, was published in 1937 and won the Hawthornden Prize in 1938. It sees the war as an extended sacrifice, and thus a metaphor of the Mass, which Jones had witnessed, after the Somme, in a little hut near the front lines while gathering wood. “What I saw through the small gap in the wall was not the dim emptiness I had expected but the back of a sacerdos in a gilt-hued planeta, two points of flickering candlelight no doubt lent an extra sense of goldness to the vestment and a golden warmth seemed, by the same agency, to lend the white altar cloths and the white linen of the celebrant’s alb and amice and maniple… You can imagine what a great marvel it was for me to see through that chink in the wall, and kneeling the in hay beneath the improvised mensa were a few huddled figures in khaki. David Jones became utterly committed to the Latin Mass and all his work reflects this. His friends thought one reason he didn’t marry was undoubtedly the demands of his work. Another was his increasingly poor mental health. His first breakdown occurred in 1933, while working on In Parenthesis. He never blames the war for these depressive lethargies that leave him unable to work or almost to live. He calls this visitor ‘Rosy.’ Rosy comes to call, and David is hospitalised. During World War Two a medical board finds him incapable of any kind of work at all. Although he himself doesn’t blame the war, he has survived the Somme and spends ten years writing about it. The Anathemata was published in 1951 and the remainder of Jones’ work formed part of a prospective longer work of which The Anathemata was intended to form a part. A number of shorter volumes were published. 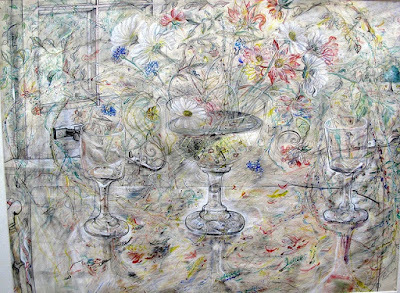 David Jones died in a nursing home in 1974, having received prizes, awards, and a C.B.E. His paintings hang in the Tate, and Dylan Thomas was one of the readers (along with a young Richard Burton) in the BBC radio broadcasts of In Parenthesis. Time, is in fact a fluid medium both in painting and in words. The time of In Parenthesis is about seven months, but… like the time of the psyche, almost infinitely recessive…The Anathemata is a long meditation of a man attending Mass sometime during the Second World War, but is not confined to a specific temporal or spatial dimension. There is in Jones’ work a conjunction of sacred, historical and mythological time. We may be at once on the Somme and at the battles of heroic Welsh legend, or on the walls of Troy (or often the walls of Jerusalem, with the Romans at the time of the Crucifixion), or with King Arthur. Fulget crucis mysterium: this goldenness that David Jones observed in the hut near the Front with the tiny congregation of sacrificial men, (at once types of Christ who will be slaughtered, and heirs of Cain who will kill others), the priest, the valid signs of the Mass as a thing that is made, became the inspiration for all his works. He says although the evensong at King’s College, Cambridge is fine, very beautiful, it’s not the same as to hear Fr. John O’Connor, his mentor, pronouncing the first two words of the Mass. It’s more than aesthetic. In the Anathemata Preface, already in 1951, Jones states the difficulties of the way he pursues. David Jones, Dai Greatcoat: A Self-Portrait of David Jones in his Letters, ed. Rene Hague (London: Faber and Faber, 1980), p. 249. David Jones, In Parenthesis (London: Faber and Faber, 1961) p. 30. 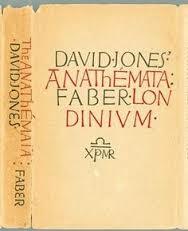 David Jones, The Anathemata. (London: Faber and Faber, 1952) Footnote 2 on page 165. 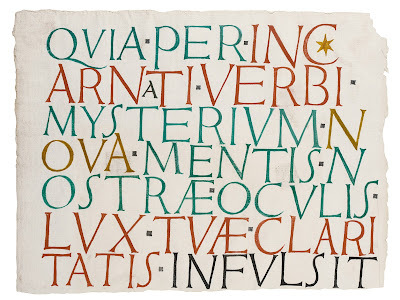 Rene Hague, ‘Myth and Mystery in the Poetry of David Jones’ in The Agenda vol 15, nos. 2-3. P. 46.